Jennifer Mangaly holds a Bachelor of Arts degree in professional writing and international studies. She graduated with honors from Baylor University in Waco, Texas. She has worked as a consultant writer and editor for over eight years for a variety of corporate and non-profit clients. Applebee’s is a large restaurant franchise with locations in the U.S. and around the world. They offer casual American dining for lunch and dinner. Their extensive menu includes appetizers, salads, steaks, chicken, seafood, burgers, pasta, sandwiches and desserts. Applebee’s is famous for their combo menus and “two for $20” specials. Applebee’s tomato basil soup is a popular option for lunch. Many diners pair a cup of Applebee’s tomato basil soup with a sandwich or salad for a lunch meal combo. Diners can also add a full sized bowl of soup to their meal, as a starter or first course. Applebee’s does not publicize the recipe to their famous tomato basil soup. Tomato basil soup obviously uses tomatoes and fresh basil. Chefs who make tomato basil soup at home use ingredients like garlic, onions, cream, tomato juice and butter to add flavor. They then simmer the soup over very low heat and serve the finished soup with croutons. A cup of tomato basil soup is part of the lunch combo; it is a slightly smaller portion size than the bowl. It has 230 calories, 13 g total fat, 6 g saturated fat, 1,190 mg of sodium, 25 g carbs, 2 g fiber and 5 g protein. 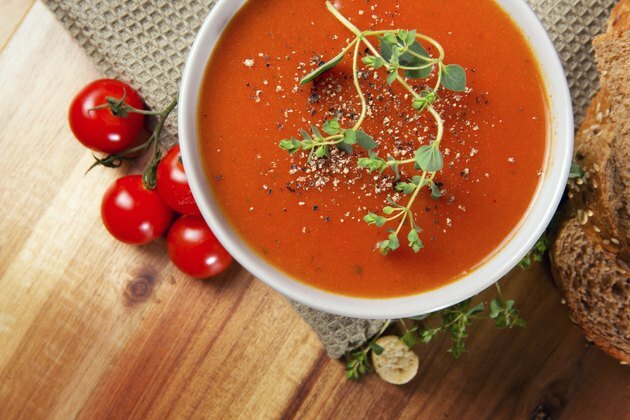 A full sized bowl of tomato basil soup contains 250 calories, 14 g total fat, 7 g saturated fat, 1,340 mg of sodium, 27 g carbs, 3 g fiber and 5 g protein. Although tomato basil soup has a high amount of vitamin C and fiber due to the tomatoes, it also has some added fat because of the butter or cream. Diners can substitute a bowl of clear soup or even a small salad for a lighter option. For example, a bowl of chicken tortilla soup has 160 calories and a bowl of chicken noodle soup contains 180 calories. A small Caesar salad at 90 calories would also be a good alternative. Tomato basil soup is often just the first course for many Applebee’s diners. To keep the meal healthy, consider ordering one of Applebee’s “Under 550 calories” entrees, such as grilled shrimp & island rice or asiago peppercorn steak. Applebee’s also has several menu items that are endorsed by Weight Watchers and follow the “WW Points” system. Some dishes are less than 400 calories each. Steak & portobello mushrooms has 330 calories, garlic herb chicken has 370 calories and cajun lime tilapia contains 310 calories.